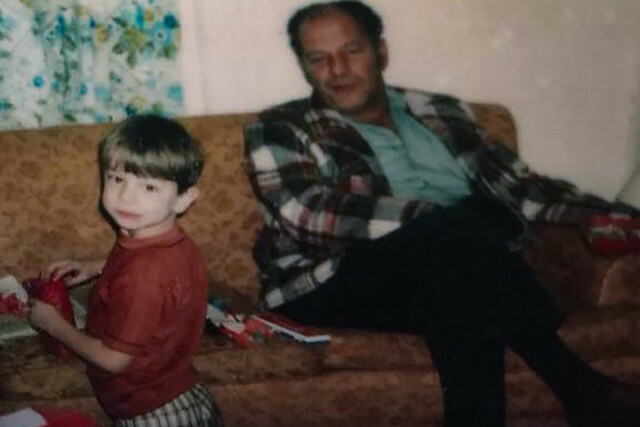 My mother posted this on Facebook a few days ago, and I thought I’d also post it here so it didn’t get lost down the Facebook memory hole: This is a picture of me and my grandfather, Michael Scalzi. I’m guessing I’m about four or five in that photo, so this would be from 1973 or 1974, and I’m guessing that it’s in my grandfather’s home in Covina, California. Judging from the presents, it’s also on or near Christmas day. I was and remained very fond of my grandfather, to whom I was closest to of all the surviving grandparents at the time (my maternal grandfather had passed away before I was born). I don’t really have that many pictures of my grandfather, so it’s lovely to see him. He looks pretty much as I remember him, albeit slightly younger here; in this photo he would be only a few years older than I am. That’s a hell of a thought. There’s not a whole lot of family resemblance between him and me, I’m afraid; physically I take much more after my mother’s side of the family than my father’s (this is flipped for my sister, who looks much more like the Scalzi side). It’s a little strange to realize how much of my grandfather at this point exists only in my memory. As I mentioned, I don’t have many pictures of him and he wasn’t a writer or actively creative, so I don’t have anything like that. If nothing else any future grandchildren of mine will not lack for supporting evidence of who I am or what I thought. I would like to have more mementos of my grandfather, of course, but I do have to say I don’t feel a lack because I don’t. He’s where I can find him, and will always be. Old photos can be spooky things. Secret agent Matt Helm once remarked that amateurs think film is too expensive, but that actually it should be expended like bullets. I once got screamed at for wasting film on a shot, but years later my sister mentioned that shot to me, saying she liked it. The agent also despised tourists wrapping their camera in a leather case. So I bought a camera I would feel safe shoving naked into in my pocket, because it is dust proof. A neighbour once took pics of all the families in the nieghborhood and nothing more was heard, then decades later, out of the blue, he sent my parents lots of photos of us kids, all lined up. One boy had a turtleneck. So don’t be afraid to photograph others for future reference. If their house burns down or something, they might thank you. but you. I enjoyed the email and I am glad to read the different directions you take.HNY. Photographs can be such a comfort and bring back so many memories. I only have a few photos of my grandparents as well and I treasure them. Nice post! I’m fortunate enough to have five paintings by my great-grandfather Stowe. He started painting when he retired at age 65 and did not stop until he died at age 94. One is a jigsaw puzzle he painted for me. It is his vision of me as a teenager. Interesting. I recently received about 20 reels of 8 mm family movies from my deceased brother. Spanning from mid-1950’s to early-1980’s. No one in the family wanted them. I had transferred them to computer video files a few years ago. So just yesterday I unspooled all of the 8 mm films into trash bags to allow recycling the metal movie reeels (not wanting the actual films to be used by some non-family person). But it was still wierd to think all of that family history heading off to some trash landfill. I’ve been thorough in transferring all family photo’s and movies to computer files .. thinking that that medium is more likely to be saved in some format as technology changes. However, I know that my immediate family and likely grandchildren will need to display some level of interest in preserving family history versus seeing unrecognized computer files and just hitting the delete key! Not a good decade for couches. I doubt my heirs will find many photos of me. But I’ll leave them plenty of photos of cats, ferrets, dog, and beehives. Your grandfather really makes me think of Jack Nicholson. This is beautiful, John. I love the smile on his face as he looks at you! Thanks for sharing this snippet of your past with us, and I’m glad that you have this memento of the two of you together. I try to get pictures of my daughter with various family members so that she’ll always have pictures to look back at in future years– as much as I can without being invasive of the present, at any rate. This is a reminder of the value of that. And it’s just kind of you to share these personal moments with us. He looks a bit like Jack Nickolson in that picture. Today the problem is too many photos, as opposed to older days with fewer. One thing I treasure among my older photos is that someone thoughtfully wrote the date and names of all “people” photos. I rarely take the time these days to catalog my current computer oversupply. Love the Bobby Knight plaid sport coat! I have pics for you. My Daddy loved you very much. In fact he told me that making you was the only thing I had done right#!! Call me Ash has number.